Wilting is due to a deficiency of water in the foliage. Death of the foliage and sometimes the shoots, large branches or the whole plant may follow. Drought is not the only cause of wilt. Root rots may deprive water to the upper portion of the plant and cause a wilt. Fungal diseases called "vascular wilts" clog the internal water conducting tissues causing plants to wilt. To determine the cause of wilting, examine the soil moisture first. Excessive water may cause root rots. Examine small roots for black discoloration. Pull on a rotted root and the external skin will separate entirely from the internal tissue. If the soil is adequately moist and the roots appear normal, the problem may be a vascular wilt disease. Vascular wilts cause wilting, withering and death to foliage of trees. Cut diagonally into the wood of an affected branch and look for sapwood discoloration in the growth ring. The discoloration is usually dark green to brown and may be in streaks. Several fungi cause wilt diseases. They act by plugging up the water and food conducting vessels in the plant. Branches which are infected generally die. Some plants die quickly while others may decline over years, losing major branches one at a time. The discolored sapwood is the result of wound gums and chemicals formed by the plant in an attempt to stop the fungal infection. A vigorous plant can sometimes lock up the fungal infection in the annual growth ring of wood, then form an uninfected ring of sapwood during the following year's growth. Maple and Russian olive trees in vigorous health often escape verticillium wilt in this manner. Stressed trees will lose major branches or die outright. Verticillium is a soil borne fungus that infects the roots of a tree or shrub but does not cause a root rot. Instead, the fungus moves into the water conducting tissues of the plant. It may affect all or only sections of a tree depending on how it is introduced into the plant. Control: One major control is to avoid damaging the root system of trees and shrubs. Although the infection may come directly from the nursery, it may also be introduced later through wounds in the root system. When the plant is infected, cut off dead branches and limbs and dispose of them. Do not use this wood for chips or compost and do not bury it near other susceptible plants. Burning is the best option. Wilt, defoliation and the premature drop of leaves help distinguish vascular wilt from other causes of wilting. Cause: Oak wilt is caused by a fungus sap feeding beetles and other insects that are attracted to wounds on the bark of trees. Infected red oaks may die within a few weeks while white oaks may linger for two or three years. In the mid-west, it appears that the infection is most likely to occur in mid-May to June. Therefore, it is important to avoid pruning, climbing with iron shoes or otherwise wounding oaks during this time. The disease may spread to adjacent oaks through root grafts. Control: Infected trees should be removed and wood, including stumps, should be debarked and split. Otherwise the wood will bloom with fungus beneath the bark and insects will carry them onto other trees. Closely planted trees should be treated to remove the chances of root grafting. This may be done by passing a root cutting blade 2 feet into the ground at the midpoint between the trees. Dutch elm disease is a fungal vascular disease responsible for killing most American elm (Ulmus americana) trees in the United States. The disease was introduced on wood from Holland (thus the name) and spread rapidly across the country. Siberian (Ulmus pumila), Chinese (Ulmus parvifolia) and certain hybrid elms are resistant to the disease. 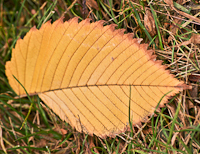 Symptoms: Wilting, yellowing foliage and leaf drop first occur on one or a few branches. Then the entire tree may wilt and die in a few months to a few years. Cause: Bark beetles that feed in the branch crotches of elm trees and burrow tunnels and lay eggs in dying or dead elm wood carry the fungus that causes the vascular wilt disease. Beetles generally are attracted to stressed trees rather than healthy trees. Controlling the beetles may help control the disease. Quickly destroying dead elm wood and dying trees and keeping healthy trees vigorous helps to limit the spread of the disease. Control: Prune out infected branches immediately. When pruning, cut well below the area showing symptoms - at least 6 inches below the brown vascular discoloration on the wilted branch. The pathogen is usually a distance beyond the symptoms. Closely planted trees should be treated to remove the chances of root grafting. This may be done by passing a root cutting blade 2 feet into the soil at the midpoint between the trees. Systemic insecticides and fungicides have been tested but do not appear to be fully effective in the control of Dutch elm disease.